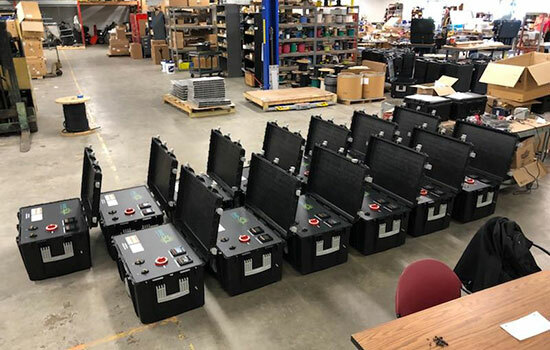 InverSOL, a Venture creations client company, will soon launch its line of lower-cost, low maintenance solar generators to residents of hurricane-ravaged Puerto Rico. Entrepreneur David Rodriguez is bringing an alternative energy solution to the nearly 3.4 million residents of Puerto Rico still living in the aftermath of Hurricane Maria. Rodriguez is the founder of inverSOL, a client company of Rochester Institute of Technology’s Venture Creations business incubator, and the developer of a new, lower-cost, no maintenance solar generator system designed to power basic home appliances. The company was formed in March, and this summer inverSOL will open a manufacturing and retail facility on the island of Puerto Rico. Rodriquez said that many residents used gas generators to power their homes, which is not only expensive, but can be dangerous. According to Rodriguez, solar generators are an emerging market, particularly in the United States, and are generally available as small units that are designed to power small items such as cell phones and camping lights. InverSOL units are focused on providing power to refrigerators, LED lights, charging stations, laptops, fans, televisions and radios. Rodriguez, who has a home, an office and several family members on the island, reported that there are still thousands of people completely without power—and hurricane season is upon them once again. InverSOL’s solar generator relies on technology that enables the unit to require no oil and runs silently, is weatherproof and is portable. He said many others on the market are poorly constructed or can only be shipped to the island unassembled. InverSOL units that are sold fully assembled on the island are priced between $2,000 and $5,000—a fraction of what it costs to install a whole-house solar solution, which range from $25,000 to $50,000. The company has also arranged to provide financing for the units through community banks on the island. In addition to this, inverSOL is employing island residents in their manufacturing, sales and service departments. Rodriguez said the last thing he needed to do was start another company. He is the founder of inverSOL’s parent company, Council Rock, a telecommunications engineering firm providing the gas and electric utilities market products and services in support of smart grid applications. Most of inverSOL engineers and support staff are RIT graduates and also work for Council Rock, which graduated from Venture Creations in 2016 and received funding from the RIT Venture Fund in 2017. Rodriguez is also grateful to his staff who have been working around the clock for several months.